"Cash Booked Offshore for Tax Purposes by U.S. Multinationals Doubled between 2008 and 2014"
In recent years, U.S. multinational companies have sharply increased the amount of money that they book to foreign subsidiaries. An April 2015 study by research firm Audit Analytics found that the Russell 1000 list of U.S. companies collectively reported having nearly $2.3 trillion held offshore. That is more than double the income reported offshore in 2008. The practice of artificially shifting profits to tax havens has increased in recent years. In 1999, the profits American multinationals reported earning in Bermuda represented 260 percent of that country’s entire economy. In 2008, it was up to 1,000 percent. More offshore profit shifting means more U.S. taxes avoided by American multinationals. The 286 Fortune 500 Companies that report offshore profits collectively hold $2.1 trillion offshore, with 30 companies accounting for 65 percent of the total. While 57 percent of Fortune 500 companies report having income offshore, some companies shift profits offshore far more aggressively than others. The 30 companies with the most money offshore account for $1.4 trillion of the total. In other words, just 30 Fortune 500 companies account for 65 percent of the offshore cash. Not all companies report how much cash they have “permanently reinvested offshore,” so the finding that 286 companies report offshore profits does not include all cash booked offshore. For example, Northrop Grumman reported in 2011 having $761 million offshore. But since 2012, the defense contractor has reported that it continues to have permanently reinvested earnings, but no longer specifies how much. The most comprehensive solution to ending tax haven abuse would be to stop permitting U.S. multinational corporations to indefinitely defer paying U.S. taxes on profits they attribute to their foreign subsidiaries. In other words, companies should pay taxes on their foreign income at the same rate and time that they pay them on their domestic income. Paying U.S. taxes on this overseas income would not constitute “double taxation” because the companies already subtract any foreign taxes they have paid from their U.S. tax bill, and that would not change. Ending “deferral” could raise nearly $900 billion over ten years, according to the both the Congressional Joint Committee on Taxation and the U.S. Treasury Department. The best way to deal with existing profits being held offshore would be to tax them through a deemed repatriation at the full 35 percent rate (minus foreign taxes paid). President Obama has proposed a much lower rate of 14 percent, which would allow large multinational corporations to avoid around $400 billion in taxes that they owe. Former Republican Ways and Means Chairman Dave Camp proposed a rate of only 8.75 percent, which would allow large multinational corporations to avoid around $450 billion in taxes that they owe. At a time of fiscal austerity, there is no reason that companies should get hundreds of billions in tax benefits to reward them for their offshore income. Reject a “territorial” tax system. Tax haven abuse would be worse under a system in which companies could shift profits to tax haven countries, pay minimal or no tax under those countries’ tax laws, and then freely use the profits in the United States without paying any U.S. taxes. The JCT estimates that switching to a territorial tax system could add almost $300 billion to the deficit over ten years. Reject the creation of a so-called “innovation” or “patent box.” Some lawmakers are trying to create a new loophole in the code by giving companies a preferential tax rate on income earned from patents, trademarks, and other “intellectual property” which is easy to assign to offshore subsidiaries. Such a policy would be an unjustified and ineffective giveaway to multinational U.S. corporations. Require full and honest reporting to expose tax haven abuses under specified transparency protocols. Multinational corporations should report their profits on a country-by country basis so they can’t mislead each nation about the share of their income that was taxed in the other countries. An annual survey of CEOs around the globe done by PricewaterhouseCoopers found that nearly 60 percent of the CEOs support this reform as a way to clamp down on avoidance. 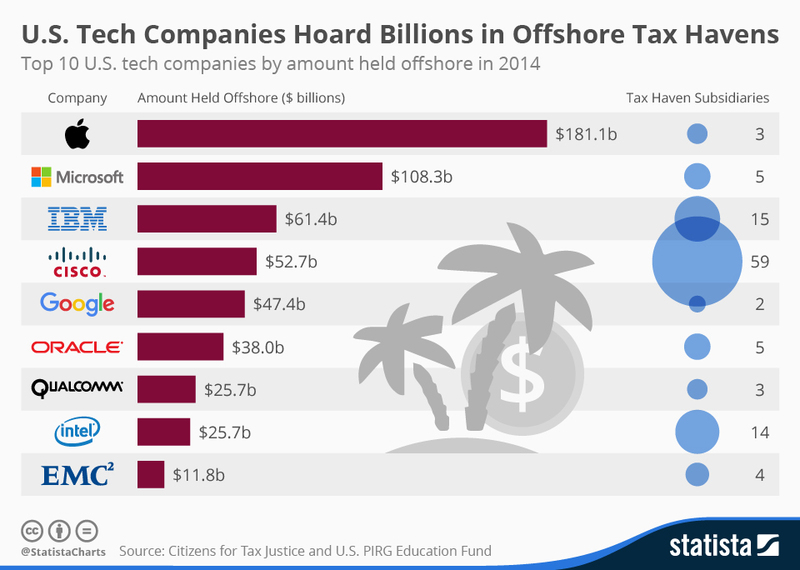 Policy makers can take some basic commonsense steps to curtail some of the most obvious and brazen ways that some companies abuse offshore tax havens. Cooperate with the OECD and its member countries to implement the recommendations of the group’s Base Erosion and Profit Shifting (BEPS) project, which represents a modest first step toward international coordination to end corporate tax avoidance. Close the inversion loophole by treating an entity that results from a U.S.-foreign merger as an American corporation if the majority (as opposed to 80 percent) of voting stock is held by shareholders of the former American corporation. These companies should be treated as U.S. companies if they are managed and controlled in the U.S. and have significant business activities in the U.S.
Stop companies from shifting intellectual property (e.g. patents, trademarks, licenses) to shell companies in tax haven countries and then paying inflated fees to use them. This common practice allows companies to legally book profits that were earned in the U.S. to the tax haven subsidiary owning the patent. Limited reforms proposed by President Obama could save taxpayers $21.3 billion over ten years, according to the Joint Committee on Taxation (JCT). Reform the so-called “check-the-box” rules to stop multinational companies from manipulating how they define their status to minimize their taxes. Right now, companies can make inconsistent claims to maximize their tax advantages, telling one country that a subsidiary is a corporation while telling another country the same entity is a partnership or some other form. Stop companies from taking bigger tax credits than the law intends for the taxes they pay to foreign countries by reforming foreign tax credits. Proposals to “pool” foreign tax credits would save $58.6 billion over ten years, according to the JCT. Stop companies from deducting interest expenses paid to their own offshore affiliates, which put off paying taxes on that income. Right now, an offshore subsidiary of a U.S. company can defer paying taxes on interest income it collects from the U.S.- based parent, even while the U.S. parent claims those interest payments as a tax deduction. This reform would save $51.4 billion over ten years, according to the JCT.